BANGI, 23 March 2013 – Learning through their own unique system have ensured all the 99 students from PERMATApintar Centre UKM getting As in all the subjects they took in the 2012 Malaysian Certificate of Education (SPM) examinations. Of the 51 students getting A+ in all the subjects they took was Ooi Tze Ching who obtained A+ in all the 10 subjects. Nur Fahana Ismail obtained 9 A+, 1 A and 1 A- while Dharsshini Reveendran obtained 9A +. 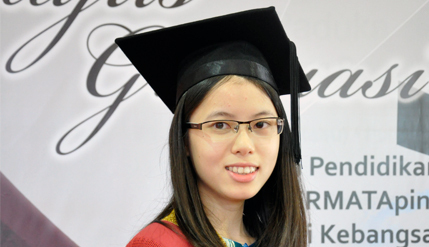 For Ooi, her lecturers who were ever ready to provide guidance whenever needed at any time, had been an inspiration to push herself to obtain the best in the SPM. The dedication of the lecturers to the students has given them with the impetus to continually focus on education, said Ooi who wants to be a pharmacist. 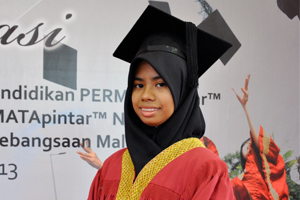 For Nur Farhana Ismail, who aspires to be an ophthalmologist, the learning system at PERMATApintar challenges her to innovate beyond the usual thereby shaping her into a more critical and creative person as well as being able to analyse issues and various happennings in the world in depth. The centre also provides her and friends the opportunity to participate in various international competitions in mathematics, physics, environment and others. Such activities had given them the chance to meet and exchange ideas with many bright students from all over the world, Nur Farhana said. Getting guidance from professors and mentors in a field of study that is of her interest has given Dharsshini Reveendran an extraordinary opportunity for success. Her experiences with her mentors include conducting research that is normally done by postgraduate students. 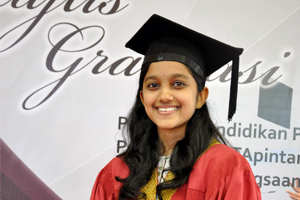 They had been an invaluable experience to Dharsshini and will guide her to achieve her ambitions to be an expert in the field of oncology, she said.